Core inflation in Japan was 3.4% in May while U.S. inflation was officially, only 2.13%. This was the fastest rise in Japanese prices since April 1982. 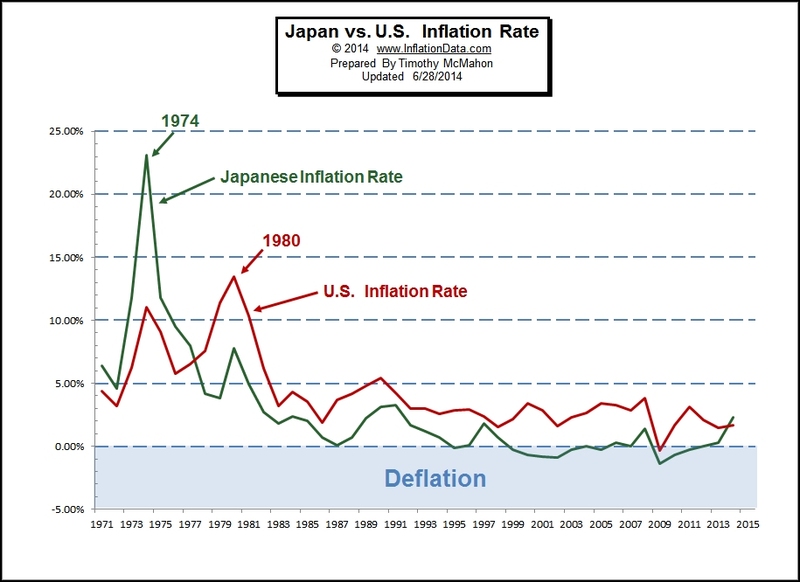 In the 1970’s inflation was bad in the U.S., but it was much worse in Japan. Every rise in U.S. inflation was multiplied in Japan, for instance, the average annual U.S. inflation rate, in 1974, was 11.04% while in Japan it was more than twice as high at 23.10%. But in 1978 a strange thing happened, Japan got its inflation under control and Japanese inflation dropped down to 4.2% while U.S. inflation remained at 7.59%. And by1979, Japanese inflation had fallen to 3.8% while U.S. inflation climbed to 11.35%. In 1980, although Japan had a setback and inflation rebounded to 7.8% U.S. inflation climbed even higher higher to 13.5%. Then as you can see from the following chart Japanese inflation stayed below U.S. inflation for the next 36 years, until now. For the first time since, 1978, Inflation in Japan is higher than in the U.S.